The planned closing of the Harbor View Hotel this winter for renovations under new ownership was previously known, but when the matter came before the Edgartown selectmen for their approval this week, it nevertheless came as a bit of a shock for many year-round Islanders. The hotel will close from Oct. 1 until Memorial Day to allow for a major overhaul that will include new rooms, new buildings and a new look, certainly at least on the inside. On the outside the historic hotel with its wide veranda custom built for porch sitting and sweeping views across the Edgartown Lighthouse, has been a landmark since the 1800s. In recent years the hotel has steadily become more than just a place for overnight guests, both in and out of season. When the wind blows sharply off the outer harbor and the skies are full of snow and most places in town are shuttered tightly for the winter, the Harbor View has been a welcoming pace with its cozy bar and restaurant and menu of special events. The hotel is a community hub when it hosts festive parties around the lighting of the lighthouse at Christmastime, a New Year’s Eve gala with fireworks over the outer harbor, and later an Easter egg hunt for children, among the many wonderful activities. 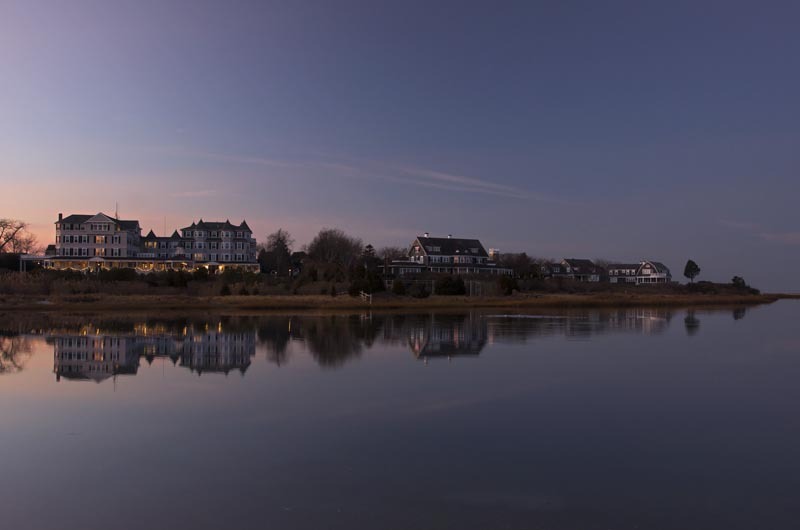 All these things will be put on pause this year, but Islanders can look forward to their return at the start of the next summer season, when the lights come back on at the grande dame of Edgartown.